Known to the Natividad family as “Father Lawrence,” Robles received his Bachelor of Arts in religious studies from CSU Fullerton and went on to graduate from the American Baptist Seminary of the West in Berkeley, Calif. In 2000, he took a position as an executive director with the Episcopal Diocese of El Camino Real, and was later ordained as an Episcopalian priest. 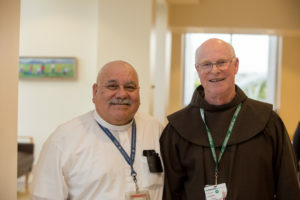 Founded 30 years ago as a nonprofit 501(c)(3), Natividad Foundation’s donors have provided the program funding and resources for the Spiritual Care program at Natividad for decades. Natividad does not receive government funding for religious purposes. Spiritual Care Advisors like Robles are available to help children, adults and families of all faith traditions explore spiritual questions and concerns that may arise during hospitalization. This important service helps patients and their families who are experiencing concern, anxiety, stress, sudden loss, or difficulties dealing with prolonged illness.